Anthony is a visionary! He is a highly skilled field educator with more than 25 years of experience. He possesses expert knowledge of color chemicals for all stages of application and can apply specialized techniques to create styles for all ages, genders, and nationalities. He maintains a comprehensive understanding of the hair care industry and salon business operations. 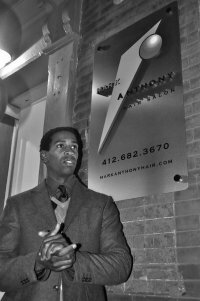 As Owner/Operator of Mark Anthony Hair Salon Inc. since 1998, Anthony supervises the staff and management team. Anthony obtained his barber and teacher’s licensing from the Pittsburgh Beauty Academy and was privately trained by Framesi International, the nation’s leading hair color care company. He has been known to conduct professional photo shoots with nationally known photographers and his styles have been placed in national magazines. Anthony travels the country teaching advanced color and cutting techniques. In 2006, he was inducted as a platform artist on the Framesi Italian Styles cutting team. Anthony conducts on-site cut and color classes to improve the technical development of his employees and recent beauty school graduates, and to prepare them to become successful technicians. Anthony served as the primary barber instructor for the Pittsburgh Beauty Academy and has worked at Bobby J’s, Pro Hair Designs, and Premadonna’s Hair Salon. Karmyn obtained a Cosmetology and Salon Management License from Pittsburgh Beauty Academy and has been in the industry for more than 25 years. She received awards for several local and national hair competitions, and did hair and assistant makeup for WQED’s Doo Wop 50. In 2001, she was awarded the opportunity to serve as key hair stylist for the audience award -winning film The Bread My Sweet starring Scott Baio and Melissa Martin. From there, Karmyn sought to explore theatrical hair and make-up. She has mastered a styling technique that is unparallelled and she delivers absolute perfection! Tee is a highly skilled and creative member of our styling team. She obtained a Cosmetology License from Pittsburgh Beauty Academy and has been in the industry for more than 15 years. She dedicated her time to mastering the art of hair cutting and design, and is an expert advisor for natural hair care maintenance, color, and cutting. Training alongsude Anthony and Karmyn has significantly developed her knowledge of chemical and coloring applications. Tee has participated in numerous local photo shoots and several of her styles have landed in Sophisticate’s national magazine. Tee pays specific attention to hair care and will stop at nothing to get your hair in top condition. Angel has a professional and artistic eye for beauty! She is very experienced with stage design and over the years has acquired experience in every discipline of hair care, including: coloring, ethnic hair care, and male and female cutting and styling. Angel received her license from Bella Capelli Beauty Academy and works with all hair types and textures. She is a natural when it comes to finding the perfect individual style. Chardae is the newest member of our design team. Her professionalism and talent have allowed her to become one of our most sought after stylists. Char specializes in cuts, color, natural hair care and lock maintenance, as well as extensions. She continues to polish her skills through continuing education within the salon and abroad. Her enthusiasm and perfectionism are bound to take her straight to the top. “Char” obtained her cosmetology license from Empire Beauty School. Her career goals are to continue learning from the hair care experts at Mark Anthony Hair Salon until she is ready to open her own establishment. Shayla Calvert is our expert esthetician and can enhance your beauty with a revitalizing facial, makeup application, brow and lash enhancement, and/or waxing services. Shayla received her license from Pennsylvania Beauty Academy and intends to continue pursuing her career as an independent beauty consultant and a theatrical and stage makeup artist. Shayla has the natural ability to transform anyone to look like a superstar! Come see for yourself the difference she can make in your overall look.